The New Dork Review of Books: What Are You Reading in 2011? To be frank, when I see the words "reading goals" or "challenges" in other bloggers' posts, I skip them almost as quickly as if they'd been reviews of Twilight. I don't mean to be a jerk, but in my view, what others are reading, for the most part, is only interesting once they've actually read them. But this is different. For me, it's always fun to look at upcoming fiction releases, especially for big-name writers. It gives you something to dorkily look forward to, right? I mean, how annoyed did you get with my near-constant, summer-long references to Freedom? I was excited! Usually, around this time, we're flush with lists of the next year's big releases. But for some reason, this year it's been exceedingly difficult to find a good list of upcoming literary titles for 2011. I've heard of a few here and there, but I don't have anything approaching a comprehensive list. So, as book fans in this modern, wiki world, let's pool our resources and get a list together of what we've heard is coming out and what we're looking forward to in 2011. And but so, for me, the list of 2011 releases I'm looking forward to practically starts and ends with The Pale King. 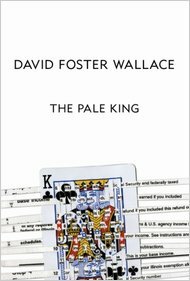 On April 15, 2011, Little, Brown will publish David Foster Wallace's last novel. The novel was incomplete at the time of his death, but no one is saying what the exact level of completion is. Also, TC Boyle is publishing a new novel titled When The Killing's Done on Feb. 22nd. Every year I say I'm going to read TC Boyle, and I still haven't. But this one sounds especially interesting. Count me in, Tom Coraghessan. That's about it, really. I can't find anything else. Are we in the midst of some sort of industry-wide publishing slump? Or am I just too picky? What are you reading in 2011? Except for the new DFW, there's only one book that is sparking any interest for me is the new Palahniuk. It's been six or seven years since I've been expecting one of his novel, but the premisce of this one conquered me. Damned is about a little girl who wakes up in hell one day. She has to figured out why she's there and how she's going to spent the whol eeternity with demons. I'm even more in the dark than you on next year's releases. I have to admit that I'm progressively growing more backward-looking in terms of my own reading list. But I'm very excited to read your reviews of War and Peace and Anna Karenina. Both are in my seven to ten, but I'm not quite sure where. Maybe you can help me figure it out? Reading GWTW won't be difficult--it's an easy read and moves quickly. I read Anna Karenina myself this year--started over Memorial Day and finished in the fall. I found parts quite easier to read, and others dense and pedantic and slow. The good news is that it is divided into 8 decent sized sections, so I was able to make mini-goals to read one section every few weeks, which kept me moving without making me dread reading it. War and Peace is on my list for summer 2011, as is Little Women. I've never read T.C. Boyle, though The Women seems to hover read smack dab in my reading ideas list. Just like Million Dollar Baby does in my Netflix queue. Well, then you will love me this year. Because I have no goals and am joining no challenges, except that I took James' TBR Dare to read only my own existing books January 1st through April 1st. THAT I am excited about. I know there's good stuff in there, and I'm resentful of "having" to read advanced copies or books to complete a challenge. Bring it on. @Ben - If you had to pick one Palahniuk (other than Fight Club) to start with, what would you pick? I'm embarrassed to admit I've never read him - maybe I'll start with his new one, too. @Patrick - Yeah, my back list is backing up, too. Maybe a blessing in disguise that there seems to be a dearth of new, interesting novels. I'm excited about AK and W&P - should be an experience! @the Ape - Nice post! As I said, the Evison looks really good. And I won't try to talk you out of giving increased priority to Million Dollar Baby. @Sandy - The idea of reading only books you have is a good one! Again, with not too much exciting happening in early 2011, it should be easier to keep your goal than most years. Good luck! Right now,I'm reading The Evolution of Bruno Littlemore by Benjamin Hale-a debut novel about a chimpanzee who has been trained to talk and has rather high intellect but winds up falling in love with his human mentor. A bit shocking in parts but incredibly well written. I also have West of Here on my TBR for next year and will be previewing a few other upcoming titles on my blog before New Year's Eve. Oh,and GWTW is a great saga-I've read it a few times and come away with different feelings about Scarlett each time. Enjoy those thick books: there are some interesting parallels between Gone with the Wind and War and Peace! War and Peace is my all-time favorite, though I've enjoyed Anna Karenina, too... I wrote a series of posts about W&P for my blog; links are on the sidebar. In any case, happy reading! @Lisa - Yeah, it's not coincidental that I'm going after GWTW and W&P in relative proximity - the great American novel and the great Russian novel. Both in the discussion for best of all time...I'll definitely look at your posts when I get underway! Well I just posted a tenuous and tentative reading list on my blog this morning, so feel free to glaze right over it. However, you remind me that I should have included The Pale King on it. I'm reading West of Here right now. While it's overstuffed with characters (even Cecil B. DeMille would go pale at all the people crammed into just the first 100 pages), I'm finding the historical fiction oddly compelling. It's certainly an ambitious book. In addition to Evison's "West of Here" and Hale's "The Evolution of Bruno Littlemore," both of which got a lot of buzz at the NY BookExpo in the Fall of 2010, and the T.C. Boyle and E.L. Doctorow books, I think books to watch for 2011 include Geraldine Brooks' "Caleb's Crossing," out in May; Chris Adrian (one of the New Yorker Magazines 20 under 40) "The Great Night" out in May; Sarah Braunstein (a 2011 National Book Foundation 5 under 35 honeree) "The Sweet Relief of Missing Children;" Teah Obreht's debut novel (she was also a National Book Foundation 2011 5 under 35 honoree), "The Tiger's Wife;" Ann Patchett's "State of Wonder" out in the summer. If you've not read T.C. Boyle, he's worth reading. I'd start with Drop City. I'm definitely up for the new TC Boyle novel. I discovered him this year when I read The Women. Hilarious all the way through, no thin spots. Philip Roth's Nemesis: What Hath God Wrought?